The nation witnessed another school shooting last week, this time in Florida. And like the swallows returning to San Juan Capistrano, the Left flocked to the tragedy in order to scream for more gun control. Of course, with the Left everything is about control, for they want the government to run every aspect of our lives, from what we eat to what we say to what we think. And they will only meet with limited success as long as citizens have the right to bear arms. So they continue to harangue the nation, hoping the 2nd Amendment becomes a dead letter. I'll never understand the mentality of people who are resistant to armed security in public schools. It's a government building. A government building with our kids inside. Why shouldn't it be protected like any other government building? So is this the answer? 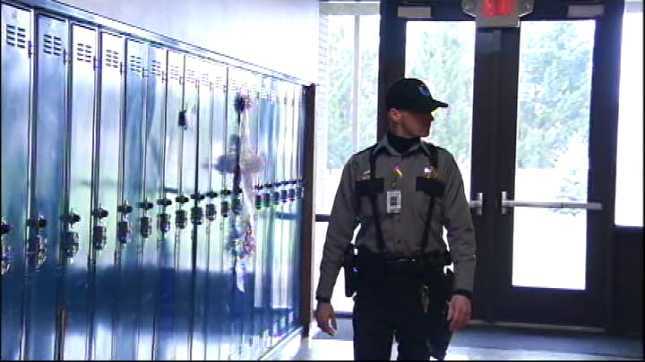 Should we have armed guards at school? While it might sound comforting, I think there are some significant negative unintended consequences of such a move. When I was working for a diocese down in Florida, one of my responsibilities was overseeing prison ministry throughout the diocese. This meant visits to various jails and prisons over the years. Anyone who’s been to a correctional facility, even for a visit, knows how dehumanizing they are. You can’t help but become a little depressed just walking through the halls. Every movement is monitored, and you are constantly aware that you have no freedom while inside these walls. This is intentional: part of the security is the psychological wearing down of the inmates. You are less likely to cause trouble if you have no hope of freedom, even in the smallest areas of your life. Also during this time in Florida, one of my daughters, who was being homeschooled, had to take the SAT. In order to do so, we had to visit the local high school in order to register her. This high school was pretty typical; it was average size and the students were middle-class. It wasn’t an inner-city school, nor was there any history of violence or significant trouble at the school. When we arrived, we had to first enter a building that gave access to the rest of the campus. We gave the secretary our driver’s licenses and she created school IDs for us, which we had to wear at all times while at the school. We then walked to the appropriate office, which shared a waiting area with the Vice Principal in charge of discipline at the school. Naturally we had to wait for over an hour (government efficiency!). While we waited, I witnessed a stream of students being brought into the office, usually accompanied by what appeared to be a security guard. It didn’t seem as if any single big incident occurred—the students were brought in for unrelated events. I was struck by how omnipresent security seemed to be in the school. Once we got what we wanted, we began to return to the building we entered. This led us past the cafeteria, and it was lunchtime. Surrounding the students were a host of security guards—at least six in total—who constantly surveilled the students. I don’t know if they were armed, but they were uniformed and intimidating in appearance. As I left the school, I couldn’t help but realize the similarities between visiting a school and visiting a prison. The same sense of incarceration and hopelessness prevailed at both. The underlying feeling, at both the school and the prison, was the crushing of freedom. I completely understand why schools have security guards. The sad fact is that they are often necessary to keep order and allow students to do their studies in peace. However, I also think the prison-like feeling in a school has a real—and negative—impact on students. If you are treated like a prisoner, you will likely begin to act like a prisoner. You will either chafe at all the restrictions, or you will become exceedingly compliant and docile to all authority. Either way, you will not be educated to your full potential, and it will fundamentally alter how you look at authority. Armed guards in schools is only a band-aid when surgery is needed. It won’t solve the problem, and it might even give a false sense of security which will lead to more long-term problems down the road. So what is the solution? There are no easy ones. The biggest problem in society, and the main cause of school shootings, is the breakdown of the family. Children who grow up in intact, loving families with the mother and father together are far, far less likely to commit these type of crimes. Yet there is no government solution that can build families; in fact, in most cases more government just weakens those family bonds. As long as we only look to legislative answers to our problems, the best we can do is band-aids, even if they cause more problems down the road.